Yes, Your Government Leaders Are Occultists Who Thumb Their Collective Noses at God | Have Ye Not Read? As a Bible student, you know that the Biblical holy days for the fall season — the Feast of the Trumpets, the Feast of the Tabernacles and the Day of Atonement — run, basically, from mid-September through the end of September, and a little bit into October. Dates and times are important to occultists, as well. Indeed, occultists often schedule occult-related events on God’s Holy Days in order to thumb their collective noses at God. For example, this year, during those same fall feast days commanded by our heavenly Father, a replica of the so-called “Arch of Palmyra,” which is also known more commonly as the “Arch of Baal,” will be displayed in Washington, D.C. from September 26 through September 30 — the same basic time-frame the Biblical holy days will be transpiring. Baal, of course, is the “god” of the Old Testament that frequently led Israel and its prophets away from our heavenly Father YHVH, causing our Father to turn Israel over to its enemies on numerous occasions. Sadly, the Washington, D.C. unveiling ceremony for this replica of the Arch of Baal will be attended by members of the United States Congressional Committee on Foreign Affairs, at 2:30 pm on September 26th. In other words, the unveiling of this Arch of Baal is basically endorsed by our own Congress. Last year, the replica of the Arch of Baal was displayed at the G7 Global Cultural Summit, March 30-31, 2017, which summit many powerful government leaders from around the world attended (see “Arch of Baal Replica Still Being Displayed Worldwide by World Leaders”). Historically, the original arch once stood in Palmyria, Syria, linking the main street of the Colonnade and the Temple of Baal. In other words, you basically had to pass through the arch in order stroll down the colonnade to enter the temple of Baal to worship. This is why it was so frequently referred to as the Arch of Baal, though its official name is the Arch of Palmyra. When a worshiper left the temple of Baal, they had to pass through that arch once more on their way out. In that sense, some have euphemistically called the Arch of Baal the “portal” of the gods. Of course, in the days of old, Baal (sometimes spelled Bel), was the chief religious rival to our heavenly Father YHVH. In other words, Baal in his various iterations is ultimately none other than Satan. What’s more, the Temple of Baal in Palmyria, Syria, where the arch would later be built, was dedicated to Baal in A.D. 32 — approximately the time of the crucifixion of our Lord and Savior Jesus Christ. Both the historical ruins of the original Arch of Baal and the Temple of Baal were destroyed by ISIS in the summer of 2015 when they encroached into Syrian territory and took the city by military force. So ultimately, not just the arch, but the temples to various iterations of the “god” Baal will also be reconstructed. “The arch was created to make a world tour and the timing and locations have turned out to be very interesting. The Arch…made its debut in London’s Trafalgar Square, on April 19-21, 2016, which coincided with the start of Beltane, an important pagan holiday on the Satanic calendar. Next, it appeared in New York at City Hall Park, on Sept 18-24, 2016, which coincided with the UN General Assembly (plus the fall equinox, which is also considered a Satanic holiday). Finally, it was set up in Dubai, UAE, on Feb 12-14, 2017, which happened to coincide with the World Governments Summit. The latest stop is Florence, Italy, from March 27 – April 27, 2017, coinciding with the first ever G7 Cultural Summit (formally the G8 but Russia was dropped). The culture ministers from US, Germany, Japan, France, UK, Italy, and Canada were in attendance. Therefore, the recreated Arch of Baal has so far been set up during a major Satanic holiday and three world summits. Uh, yes. Satan is certainly trying. And our world leaders seem to be all too happy to oblige his efforts to blaspheme our heavenly Father. 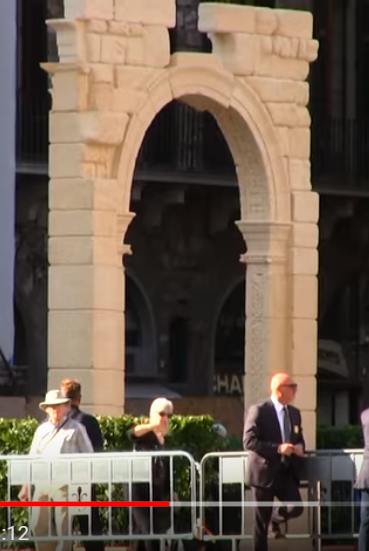 By displaying this Arch of Baal in important world capitals and at various world summits, the leaders of the governments of this world essentially demonstrate their fealty to the gods of old and the religious traditions of old, rather than to our heavenly Father and His anointed Savior. And bringing that massive arch to America and displaying it in our capital city, over the holy feast days of YHVH, and over the earthly birthday of His son, Jesus Christ, is about as blasphemous as you can get. And since Revelation 2:27 tells us that event will actually take place at His second advent, we know for a fact that now, in the final days of this flesh earth age, is the time in which the kings of this earth are turning their backs on our heavenly Father and His Christ. Perhaps that’s why you’ve seen such a dramatic acceleration of the slow motion overthrow of the western Christian moral order over these past few years. Just Fans of Ancient Culture? Our heavenly Father didn’t have that second Psalm written because the governments of this world respect and worship Him. Quite the contrary. He had that Psalm written because the leaders of the governments of this world don’t have any respect for Him, nor do they worship Him in spite of occasional lip service you might hear, usually during election time. If you just open your eyes a bit, you’ll see this to be true. And of course, having read the Book of Revelation with understanding, you know it’s only going to get worse all of the way up to Satan’s arrival. But it will all be done with at Christ’s Second Advent. And for that I praise our heavenly Father and His Christ. And so I say the same: Come, Lord Jesus.